Time to sell your Sea & Sun condo? Read about today's resort-market condo buyer. 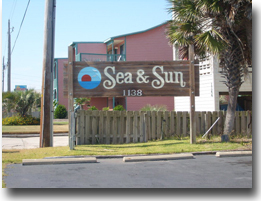 Sea & Sun condo development is a low-density complex with with only 19 total condo units. The property is located one and a half miles west of the intersection of Highway 59 and Beach Boulevard. Sea & Sun condominium was built in 1982 and the floor plans for Sea & Sun are smaller: the building is composed of one- and two-bedroom units. If you have any further questions, need info or would like to schedule a private viewing for Sea & Sun condominiums in Gulf Shores or any other condo or property, please email info@condoinvestment.com or call (251) Area-Pro (251-273-2776) for immediate assistance. RENTAL TIPS to increase your Sea & Sun rental revenue. Find annual rental incomes for Sea & Sun and all other Alabama Gulf Coast condos. Listing information last updated on April 22nd, 2019 at 6:45pm CDT.